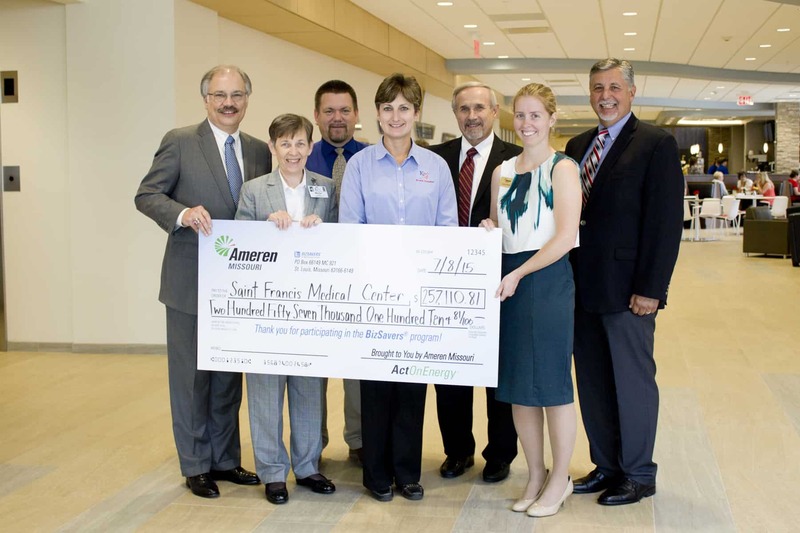 Ameren Missouri representatives present a $257,110 check to Saint Francis Medical Center for its energy efficiency projects from the Building on Excellence project as part of Ameren Missouri’s BizSavers energy efficiency program. From left: Steven C. Bjelich, FACHE-D, Saint Francis President and CEO; Marilyn Curtis, Vice President of Building on Excellence at Saint Francis; Mark Culberson, BOE Project Manager at Saint Francis; Robin Tolbert, owner, KT Power Systems; Rick Essner, director of Facilities Management at Saint Francis; Laura Klipfel, customer service advisor, Ameren Missouri; and Bob Dixon, Southeast Missouri division director, Ameren Missouri. Saint Francis Medical Center has completed its 26th energy efficiency project in three years working in partnership with Ameren Missouri’s BizSavers energy efficiency program. Ameren Missouri awarded Saint Francis $281,195 in cash incentives for the energy efficiency improvements. The Medical Center’s Building on Excellence expansion and renovation project incorporated energy efficient lighting, lighting occupancy sensors and heating and cooling systems in the recently completed five-story patient tower. The two most recent projects alone earned more than $257,000 in incentives. As a result, the Medical Center is saving more than five million kilowatt-hours per year, or approximately $290,000 in annual energy costs. Saint Francis is currently in the process of completing two additional energy efficiency projects.